Soo Theatre Arts Resource Studios is offering two visual arts workshops for children and parents in the month of April. “Let’s Draw” for children grades 3-5 with parent will be offered Saturday, April 14, 10:30 am to 12:00 pm. In this workshop, participants will share in the discovery of how drawing is a tool for expressing thoughts and telling stories. The tuition for this workshop is $12 plus a $3 materials fee. “Monet and Me” for children grades 1-5 with parent will be offered Saturday, April 28, 10:30 am to 12:00 pm. Using reproductions of great masters to stir imagination, parents and children will share beliefs about art. The tuition for this workshop is $12. The instructor for both of these workshops is Linda Whitetree Warrington. Registrations are being accepted now for these workshops at the STARS office, 534 Ashmun St. Advanced registration is required. For more information, contact STARS at 632-1930. “The Seven Last Words of Christ” by Theodore DuBois will be presented by the combined choirs of Singers United and Lake Superior State University Tuesday, March 27 at 7:30 pm. at St. James Episcopal Church, 533 Bingham Ave., Sault Ste. Marie, Michigan. Soloists for this choral work will include Karen Hughes, Lola Kennedy, Mike McKinley, Gary Van Lue, and Jeff Weissgerber. The choirs are under the direction of Karen Hughes. Organist will be Bob Aldrich. Admission is by donation. Singers United is a performing group of Soo Theatre Arts Resource Studios (STARS). STARS is a program of Soo Theatre Project, Inc.
Saturday, March 24, 2007 2-4 p.m.
Solo Singers and Chorus: Please prepare one song or aria. Bring a copy of your music; an accompanist will be provided. The Magic Flute is an opera written in the form of musical theater with dialogue and music and will be performed in English. There are a few small speaking roles. Additional roles: Priests, Slaves, People etc. Please contact us if you are interested in being involved in our summer season. We are seeking singers, actors, dancers, set builders, costume designers, etc. We want to know who you are! Auditions will take place at the Soo Theatre Arts Resource Studios (STARS), 534 Ashmun Street. 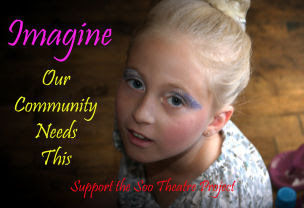 Please visit http://www.sootheatre.org/ for more information or call 632-1930. Support the Soo Theatre Project! If you could change the world, would you? We need your help now more than ever. Support the Soo Theatre Project!